The Glocknerhof model aircraft school was founded over 40 years ago. The training programme has been continuously improved and the material has been adapted to meet increasing requirements. We offer flying courses: Intensive courses and XXL courses for gliders and engine-powered aircrafts. 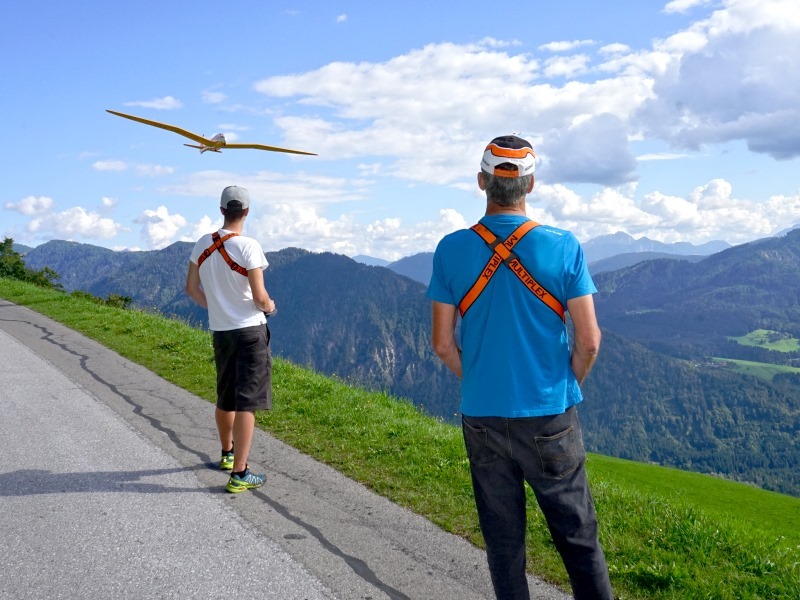 We have also recently started offering a Glider Acrobatic, Aerotow and Workshops for Hill Soaring on the hillside itself. You will find further information at the bottom of this page. After 40 years flight instructor Peter Kircher passed on the responsibility to the next generation. 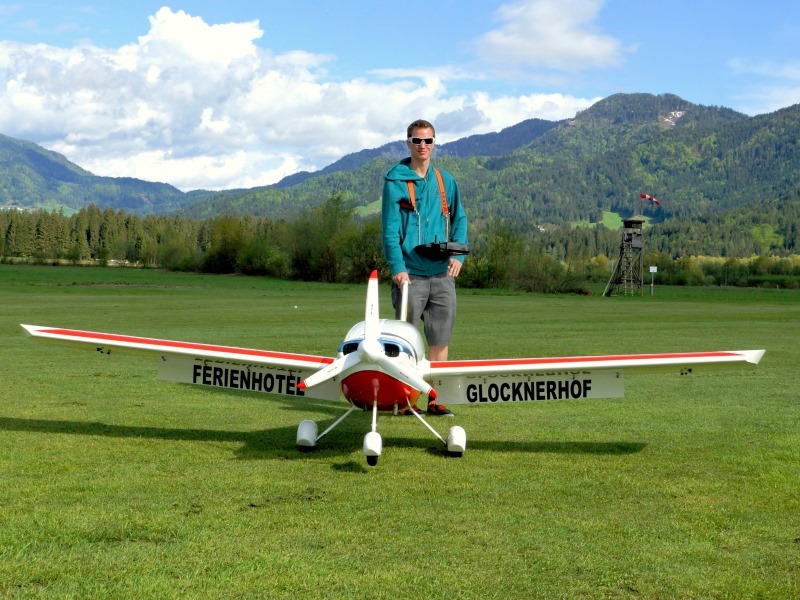 Marco Duregger, our famous pilot for Airtow, is the new flight instructor at the Hotel Glocknerhof starting spring 2019. All courses got more flexible, the course offer got extended to respond individual wishes of the guests. Setup & Maiden Flight - We do the first flight with your new aircraft. The flying school is run on our model aircraft airfield (2 minutes from the Hotel) from April to October, usually in the morning from Monday to Friday. In the hotel hall you have a flight simulator from Horizon Hobby to train after the lessons. Because of great demand for model aircraft courses and hill soaring seminars, we ask you to book early. To guarantee your desired dates we ask you to send us an enquiry in good time or best of all to book online immediately. If the courses are not available for booking online under “Model aircraft” please contact us directly. 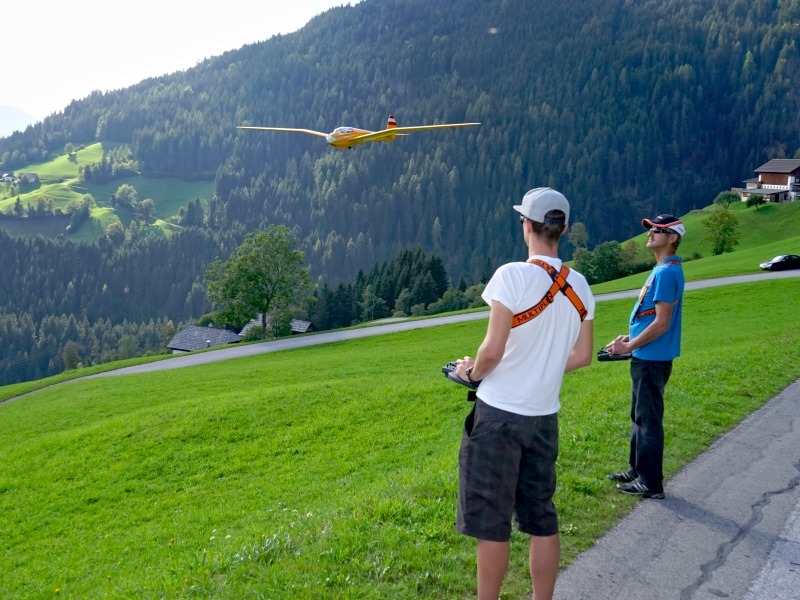 You learn how to fly with Model Aeroplanes without stabilization. We fly the school’s own models – totally free from risk for the flying students. Flight instructor Marco trusts in his fun methods to make progress practically and quickly: theory is conveyed during flights – without any idle time! This is the only way of teaching the flight students their hobby so they can have fun at the same time. If you do not yet own a model aircraft we will be pleased to advise you; this will save you time and a lot of learning the hard way. You book a course for model flying. The flying instructor will test your skills during joint operation by both student and instructor, so that he can immediately put you on the training programme that is right for you as an individual. There are different model aircrafts available, which can be used according to the skills of the flying student. During the course it is sometimes possible to switch to a more demanding model if needed. The benefit is that the flying students are always challenged so that the maximum training success is achieved. Every flight mode (mode 1 to 4) is possible. Prices are per flying student for 10 units of 50 minutes each instruction with a maximum of 2 flying students at the same time. If there participates only 1 student, the duration of the course reduces to 7 units. Everythin is included: Insurance, airfield fees, loan model aircrafts, remote control devices, fuel, repairs and 20 % VAT. If the weather is bad you will only be charged for the units actually flown. 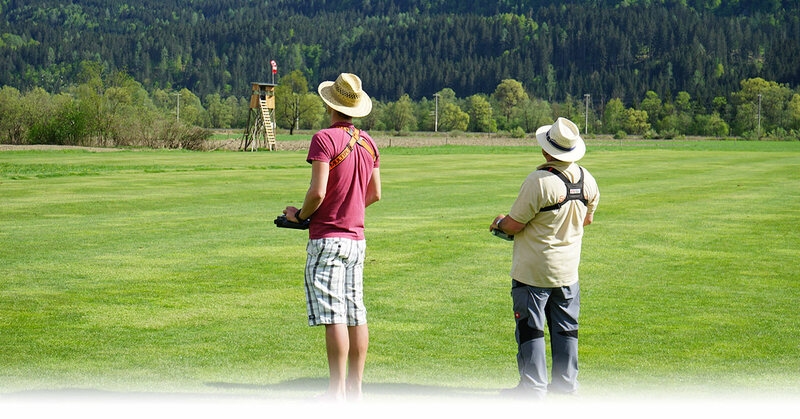 Model aircraft courses are usually held in the morning from Monday to Friday on the Glocknerhof model aircraft airfield. The afternoons are free for excursions and relaxation. If you want to fly aircraft on the airfields outside the model aircraft course – in other words without the instructor – you require public liability insurance. Please complete this form: Registration for model aircraft pilots. You will find useful items and information amongst the model aircraft Downloads. Our hill soaring workshops take place on fixed dates on 4 afternoons on our own local slope Rottenstein. The workshops are about learning hill soaring, gathering practical experience and getting important tips and hints from experienced pilots. 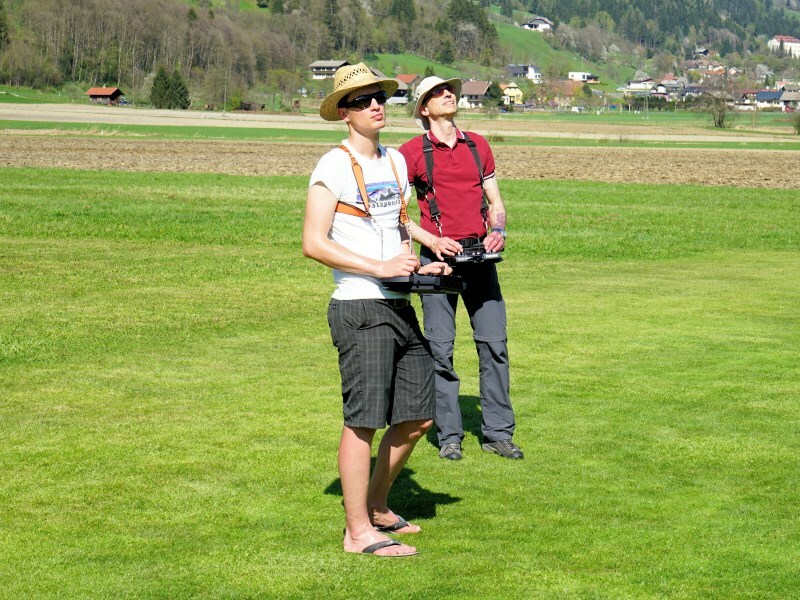 You should bring a glider with you – it does not matter whether it is purely a glider or is engine-powered. The workshops are aimed at pilots who have already mastered flying a standard model aircraft on the flat and want to tackle the subject of hill soaring and thermals. 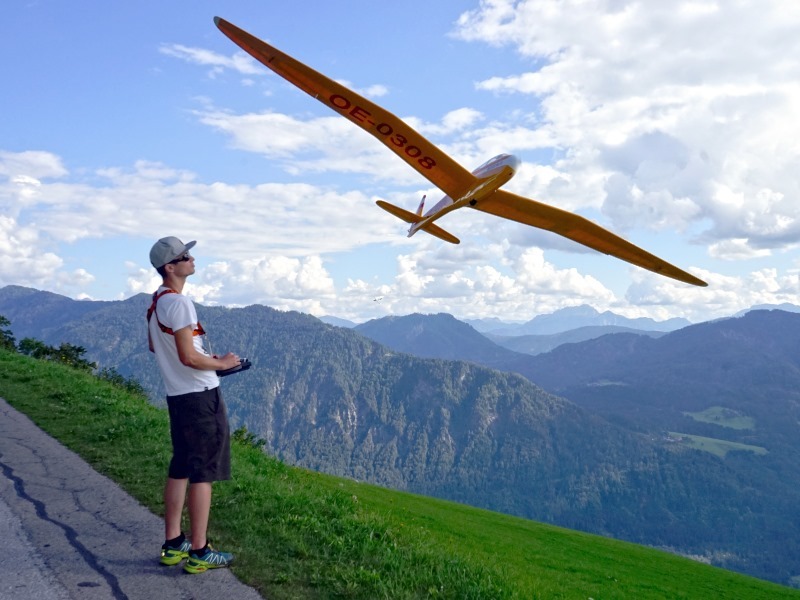 Click here to find full further information and dates for hill soaring workshops at the Glocknerhof. In this workshop you can learn how to build a model aeroplane. Every participant builds his own model aircraft during this week. All models are build traditionally in balsa and get covered with a skin of fabric. Aim of the workshop is to learn all practical and theoretical skills to build and repair model aircrafts. Your new model aircraft gets the setup and the maiden flight with flight instructor Marco - depending on the progress of construction. here are further information regarding Model Aircraft Building at Hotel Glocknerhof. You want to have a special Model Aircraft, but you don't have enough time, patienc or skills to build it on your own? Here you are right! You get fulfillment: We build the model aeroplane as you wish, we do the setup and we do the maiden flight and of course a demonstration flight with the customer. We recommend to combine the handing over with a short break at Hotel Glocknerhof. Further information about our Service: Model Aircraft building & repairing.